EJSM-Laplace will carry out an in-depth study of the Jovian system and its four largest satellites, with particular emphasis on Ganymede and Europa. It will utilize two spacecraft, the Jupiter Ganymede Orbiter (JGO) and the Jupiter Europa Orbiter (JEO), flying on complementary trajectories and carrying complementary instruments. 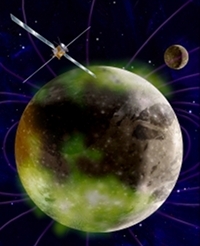 The mission sets out to achieve the following science objectives: characterize Ganymede and Europa as planetary objects and potential habitats; study Ganymede, Europa, Callisto and Io in the broader context of the system of Jovian satellites; and focus on the science of Jupiter itself including the planet, its atmosphere, magnetosphere, irregular satellites and rings. The two spacecraft will also investigate, in depth, complex couplings with the Jovian system. Jupiter is the archetype for the giant planets of the Solar System and for the numerous giant planets now known to orbit other stars. Moreover, Jupiter's diverse Galilean satellites - three of which are believed to harbour internal oceans - are central to understanding the habitability of icy worlds. Understanding the Jovian system and unravelling its history, from its origin to the possible emergence of habitable environments, will give us a better insight into how gas giant planets and their satellites form and evolve. In addition, new light should be shed on the potential for the emergence of life in Jupiter-like exoplanetary systems. The EJSM-Laplace mission will address two themes of ESA's Cosmic Vision programme: What are the conditions for planet formation and emergence of life? and How does the Solar System work? Internal oceans - habitable worlds? The overarching theme for EJSM-Laplace is to “study the emergence of habitable worlds around gas giants". 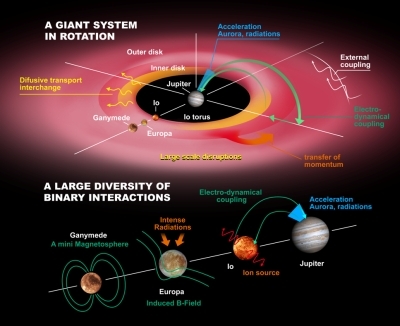 Of particular interest is how the Jovian system came to have such diverse components and how much this is affected by interactions between them. 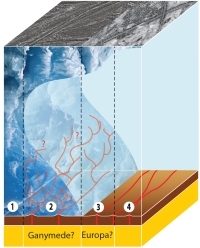 In particular, EJSM-Laplace aims to characterize the conditions that might have led to the emergence of two internally active ocean-bearing worlds, Europa and Ganymede, with particular reference to the gravitational coupling of Io, Europa and Ganymede (the so-called Laplace Resonance), playing a role in tidally heating the satellites — the primary heat source for these moons. To further understand the Galilean satellites as a system, Europa and Ganymede are singled out for detailed investigation as they provide a natural laboratory for comparative analysis of the nature, evolution, and potential habitability of icy worlds. The primary focus is on an in-depth comparative analysis of their internal oceans, current and past environments, surface and near-surface compositions, and their geologic histories. Objectives for studying the other two Galilean satellites, Io and Callisto, have also been defined and EJSM-Laplace will study these objects with a resolution and coverage far beyond what was achieved by the Galileo mission between 1989 and 2003. 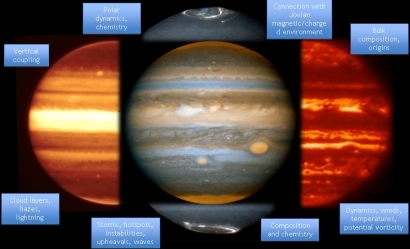 In addition, a broader study of Jupiter's atmosphere and magnetosphere will take place to complement the more in-depth analysis of the system's individual components. 4) very thin upper icy layer (3-4 km). Cases 3 and 4 are the most probable for Europa, and cases 1 and 2 for Ganymede and Callisto. The two orbiters will first trace out a trajectory around Jupiter that includes many flybys of the Galilean moons before diverging, with JEO orbiting Europa and JGO encircling Ganymede. These two moons have many geophysical similarities as well as some important differences. With EJSM-Laplace, it will be possible to perform an in-depth comparison of this pair of "false twins", to understand the origin of their geophysical dichotomy and to better understand the unique characteristics of Ganymede and Europa with emphasis on their habitability. Jupiter atmosphere studies: Dual spacecraft communication capability is being considered as the baseline configuration. This would allow probing of Jupiter's atmosphere and ionosphere as well as the exospheres of the Galilean satellites by measuring the signal properties when sending a radio beam from one spacecraft to the other, such that it passes through part of the atmosphere of Jupiter or the exosphere of the moons. This could take place at a wide longitude range that is not achievable with classical radio science based on an Earth-spacecraft communication link. Coordinated observations would strongly enhance the capabilities of the imaging and remote sensing instruments in the studies of Jupiter's atmosphere. Jupiter magnetosphere studies: In the notional example where JEO enters Jupiter orbit a few months prior to JGO, JGO will monitor the solar wind, while JEO observes the Jovian magnetosphere from within. This will help to untangle the induced solar wind, from the internally driven processes in Jupiter's magnetosphere. Io volcanism and torus dynamics: JEO will observe Io's volcanic activity through remote sensing and in situ observations during close flybys, while JGO will observe the global context and effects on the Io torus via remote sensing from afar. Jovian Magnetosphere: Investigation of the Jovian magnetosphere as fast rotator and plasma accelerator, plasma sources and coupling processes between magnetosphere, ionosphere, thermosphere; aurorae and radio emissions in response to the solar wind; interaction between the Ganymede magnetosphere with the circum-Jovian plasma environment. Satellite System and Rings: Investigation of temporal variations in Io's activity; the moons' interactions with the magnetosphere; gravitational coupling and long-term tidal evolution of the Galilean satellites; studies of small satellites (including mass determination, ephemerides, surface composition, new detections) and rings.